I’d like to introduce myself. I am Fred Riger, Operator of Grand Bahama Scuba. 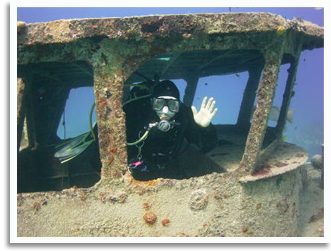 For over twenty five years I’ve been showing people the great diving available here in the waters of Grand Bahama Island. Working with a business philosophy based on personal service and diver safety, all dives are done in small, friendly groups of divers. Our home, Grand Bahama, is blessed with unique features that have created diverse dive sites of great beauty. A broad shallow bank extends offshore bordered by a shallow barrier reef. The reef is followed by a gradual drop-off that slowly descends in a stepwise fashion to a vertical wall plunging from two hundred to two thousand feet. The shallow waters provide food that supports a fascinating reef population, while the influx of clear water from the deep, virtually guarantees incredible visibility.